A thorough analysis of American marriage throughout the ages. In this comprehensive examination, Finkel (Psychology/Northwestern Univ. ; co-author: Self and Relationships: Connecting Intrapersonal and Interpersonal Processes, 2006, etc.) traces the evolution of this sacred institution from the earliest days of hunter-gatherer societies to modern times. For most of the narrative, the author studies the way marriage has evolved over the centuries based on the needs and desires of people. Early unions centered around food, shelter, and child-rearing, which morphed into more "love-based" relationships in the 1700s and 1800s. Outside influences—such as the industrial era, world wars, the free love of the 1960s, the increase of women in the workforce, and the need for both parents to work—have also played critical roles in changing the marriage paradigm. For those looking for solutions to their own marital issues, Finkel offers a variety of "love hacks," quick, temporary fixes for small issues that often arise in marriages. The author then goes on to provide more lasting strategies that couples can incorporate to create a thriving marriage in which each partner is free to express him- or herself and experience personal growth while supporting and encouraging his or her spouse to do the same. Finkel also emphasizes the importance of having friendships and relationships outside the marriage, traveling alone, living apart but being together, lowering one's expectations of one's spouse regarding the "perfect" marriage, and encouraging masturbation and sexual exploration. In addition to extensive research, the author bolsters the narrative with charts, diagrams, and numerous quotes from a variety of sources. As the author writes, it is possible to create a loving, lasting union, but it requires work, communication, and commitment on the part of both parties, and the process will change as time progresses. 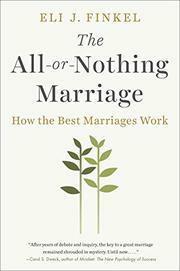 Finkel puts marriage under the microscope in this more-history-than-self-help scrutiny of the institution.